Hey Portland! 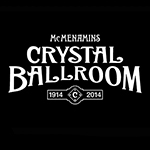 You’ve supported the Crystal Ballroom for over a century, and it’s about time we paid you back. Our “Join The Band” loyalty program gets you in the mix! 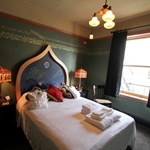 Sign up now and start earning points for all your online ticket purchases at the Crystal Ballroom and Lola’s Room – we’ll keep track and send you regular statements about where you stand. Redeem points for admission to events, Crystal-stylized merchandise, and add-on experiences to make your next Crystal Ballroom visit even more memorable. You’ll find points coming at you from other directions, too. Like special offers where you can win for eating or drinking at our various pubs around the property. Or winning random contests on our social pages, or even at our shows out of the blue, just because we’re cool like that. As part of your membership we’ll also send you a regular email updating you about our latest rewards, new ways to earn points and any exclusive benefits we’re offering to our members. We’re all having a blast with this program, so join up and get some points in your bank, and be part of the mix at the Crystal Ballroom. See some of our favorite rewards below or click here to see all you’ll be able to save for!